Hazardous vapors, gases, fumes, radioisotopes, and infected cultures are all found in laboratories and other settings as part of a normal work environment. Whether it be a scientist, pharmacist, researcher, or another occupation, without these toxic materials, personnel would be unable to carry out specific tasks or complete their work. They could be mixing, combining, adding, removing, or studying, these elements are “necessary evils” for some occupations and for businesses to thrive. Thankfully, to prevent workers from exposure to the harmful substances, protective safety devices are available, and we’ll look at the differences between a fume hood and a laminar flow hood. What is a Laboratory Fume Hood? A laboratory fume hood is a ventilated enclosure that allows personnel to conduct hazardous work in a partially enclosed space. 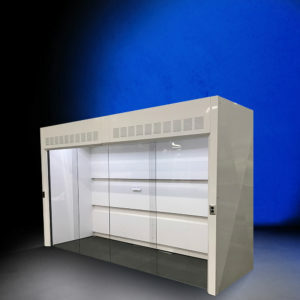 Specifically, fume hoods protect personnel from the effects of toxic fumes by exhausting vapors away from the work area. They ensure proper ventilation of the laboratory by circulating air. They shield workers from fires and unintended reactions that may occur while inside the fume hood. And they contain chemical spills if one were to occur. Also known as a laminar flow cabinet, laminar flow closet, or tissue culture hood, a laminar flow hood is an enclosed bench designed to prevent contamination and provide a sterile work area. Used for substances that require the utmost purity, air is moved through a high-efficiency particulate air (HEPA) filter and pushed in a laminar flow through the work area. This constant flow of pure air keeps the items free of contaminants and airborne substances. Although it is common for both of these devices to perform similar tasks, there are differences in how they operate. Fume hoods are used to contain gases, vapors, and fumes and then exhaust them out of the area. Laminar flow hoods are used to provide a sterile area for conducting biological experiments. Flow hoods protect personnel from harmful disease-causing organisms that are being studied. As air flows through the middle of the fume hood, it pushes the harmful gases, vapors, and fumes toward the exhaust area. Often through ductwork, the toxic air is diluted and released into the atmosphere. On ductless fume hoods, the air is filtered and recirculated back into the room. Laminar flow hoods have two airflow patterns–vertical and horizontal. In a vertical flow hood, the filtered air flows downward toward the working bench. In a horizontal flow hood, yup, you guessed it, the filtered air flows horizontally through the cabinet. Regardless of the flow of air, there are three kinds of laminar flow hoods that have been developed to meet various research and clinical needs. Class I laminar flow hoods offer significant protection for personnel and the environment. The air flows from the laboratory into the chamber in a similar design to chemical fume hoods. Class II laminar flow hoods are designed for work involving BSL-1, 2, and 3 materials. The air flows from the laboratory into the chamber while also flowing downward toward the working surface. The exhaust air is sent through a HEPA filter before being released into the environment. A Class II laminar flow hood should always be used when handling virally infected cultures, radioisotopes, carcinogenic or toxic reagents. Class III laminar flow hoods are gas-tight and provide the highest level of protection for personnel and the environment. Air that enters or exits the chamber is passed through a HEPA filter. Class III laminar flow hoods are required when working with known human pathogens and BSL-4 materials. Primarily, a fume hood protects users from toxic substances found within the hood. By controlling these toxins they are moved away from the work area and released into the environment through the exhaust system. Fume hoods also provide limited protection in the event of an explosion and will contain spills that occur inside the cabinet. A laminar flow hood not only protects personnel from contamination but also protects the substance under study from contamination. And because of the use of HEPA filters, laminar flow hoods provide environmental protection, as well. Fume hoods and flow hoods are two pieces of laboratory equipment that are vital for everyday work, but they serve different purposes. As one of the most important appliances in a work setting, both of these devices serve a critical role. They keep personnel safe while allowing important tasks to be completed. When used properly, users of these devices can assure themselves a safe work environment when handling toxic chemicals or disease-causing microorganisms. How to Ergonomically Use a Fume Hood? What is the Importance of Fume Hood Face Velocity?